Michigan State interim president blasts ESPN's "sensationalized package of reporting"
"This was a sensationalized package of reporting that contained allegations and insinuations that we are now reviewing." 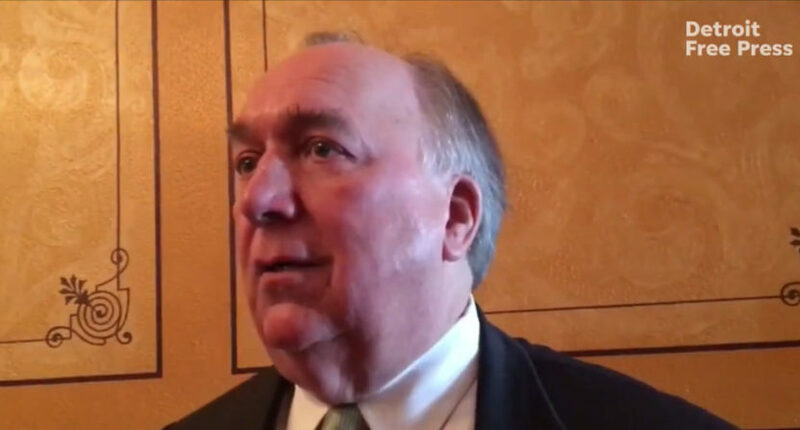 Michigan State named former Michigan governor John Engler interim president in the wake of Lou Anna Simon’s Jan. 24 resignation amidst the Larry Nassar scandal, and Engler has now publicly responded to ESPN’s Outside The Lines report (initially released Jan. 26, updated Feb. 1) titled “Michigan State secrets extend far beyond Larry Nassar case.” That report covered the university’s unsuccessful court battles with ESPN over campus police records requests, numerous instances where players and coaches in the men’s football and men’s basketball programs were accused of violence against women and sexual assault, and the alleged actions from football and basketball head coaches Mark Dantonio and Tom Izzo around those accusations. I viewed with great concern a recent ESPN report that gathered considerable national attention in no small part because it showed a promotional graphic of our head football and men’s basketball coaches with Larry Nassar. This was a sensationalized package of reporting that contained allegations and insinuations that we are now reviewing. The coaches were asked to refrain from comment while the reports were examined. That has been a burden that must be lifted. I hope that MSU can soon respond in full and affirm the integrity and probity that has been the hallmark of these two respected coaches. Complaining about graphics in news reports is a long-standing tradition, but both sides have somewhat of a point in this case. Yes, the accusations against Dantonio and Izzo are not of them committing sexual assault personally, unlike Nassar, and they also don’t involve nearly as many cases. Some will argue that being put in a graphic with Nassar implies equivalence between him and Dantonio and Izzo, which seems to be the point Engler is making here. That’s a case that’s already been made by local media members like Graham Couch of The Lansing State Journal, who called ESPN “irresponsible” and wondered how these non-Nassar scandals compared to other schools, but it’s not necessarily a good argument. There’s definitely a case for how ESPN handled this too, including the use of this graphic. The thrust of their story was about how accusations of sexual assault and violence against women at Michigan State went far beyond Nassar, how institutional policies and instutitional leadership (it’s perhaps notable that long-time athletic director Mark Hollis announced his retirement Jan. 26, the same day this story dropped) may have contributed to the problem in both the Nassar cases and basketball and football cases, and how there were specific complaints about the handling of these situations by Dantonio and Izzo. This was not a report that just happened to mention those two coaches because they also work for Michigan State; they, and their programs, were central to the piece. And it’s not like ESPN is the only one looking at Michigan State athletics and its handling of sexual assault and violence against women complaints through a wider lens in the wake of the Nassar scandal; the NCAA announced its own investigation into the school on Jan. 23. Beyond that, it’s interesting that Engler’s statement says this was “sensationalized” reporting, but doesn’t spell out how. And his statement says that Michigan State is “now reviewing” the allegations, but he’s already concluded that they’re “sensationalized”? Moreover, it’s curious that he hopes the school can “affirm the integrity and probity that has been the hallmark of these two respected coaches” while this review is still ongoing; that sounds like he’s already made up his mind that they didn’t do anything wrong. Perhaps Engler will lay out specific issues he has with ESPN’s report once Michigan State finishes its own review, and perhaps that review will help convince others to come around to Engler’s own belief in the “integrity and probity” of these coaches. But considering that students and faculty have already called for Engler’s resignation over their lack of input in his selection and their concerns in how he’s handling the situation, there also may be further opposition ahead for him. For now, this looks more like a lot of bluster than a substantive critique of ESPN’s reporting. It’s notable to see an interim university president go after ESPN this way, especially without detailing points of opposition and especially while an internal review is still underway, but there isn’t necessarily a lot here that proves ESPN did anything wrong. And this falls in line with Michigan State’s long history of opposing ESPN, particularly through those records court battles, which saw the highly unusual step of the school suing the media outlet to try and not release records. With those records now out, and with those raising troubling questions about the Spartans’ football and basketball programs as well as the athletic department as a whole, it might be a better look for Michigan State to pledge to fully investigate what happened instead of going after ESPN. Their announced investigation is one thing, but if they’ve already concluded their coaches acted with “integrity and probity” and that ESPN’s report was “sensationalized,” it’s hard to have much hope that investigation will lead to anything beyond more ESPN-bashing.